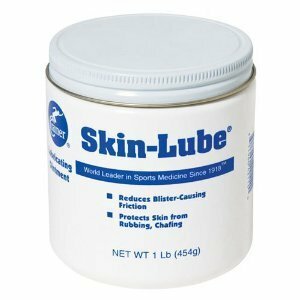 Higher melting point than petroleum jelly for long-lasting protection and prevention of blisters and chafing of friction-prone areas. Not one, but three friction-fighting ingredients. Use on calluses, under straps, on the heel, sole and instep, on inside of thighs and knees and other friction prone areas. Lighter, smoother, and less greasy than most products. Available in a 1 lb tub or a 2.75 ounce tube.